This is a review for the supplement TAC-SCI Elite Focus. The manufacturer claims that this supplement can improve mental and visual clarity. Read on to learn more about this product and whether or not it is the ideal choice for you. Amino Acids- Works to prevent stress and increase brain function. Antioxidants- Works to protect eyes from a variety of damage including UV and free-radical. Eyebright- Works to prevent eye fatigue and inflammation while improving motor coordination. Ginger-Aids in amino acid absorption and behaves as a natural anti-inflammatory. Magnesium- Aids in muscle and nerve function. Chromium- Works to support energy metabolism and blood sugar levels. Beta Carotene- Works to protect eyes and improve night vision. Vitamin E– Works to prevent eyes from damage caused by UV light and promotes good cardiovascular health. Eleuthero- Works to prevent stress and increases focus. Choline- Works in increase memory. It is recommended that three capsules be taken daily. Depending on your size, one or two capsules may be sufficient. It may require you to experiment with the capsules to determine how many are enough for you to achieve the desired results. It was also suggested that the capsules be taken on an empty stomach to allow the amino acids to be absorbed better. This product costs $35.00 on the manufacturers website. Each bottle contains 90 capsules, which is a 30-day supply. The manufacturer offers a 100% satisfaction guarantee. Users who are not satisfied with this product and wish to discontinue use can return the unused portion of the supplement to the manufacturer for a full refund. This is very helpful if you find that you do not like the product. There are no customer reviews or testimonials available on the manufacturer’s website, so it is not known if this product has worked for others. This may be an issue for some who like to read customer reviews before purchasing a product. 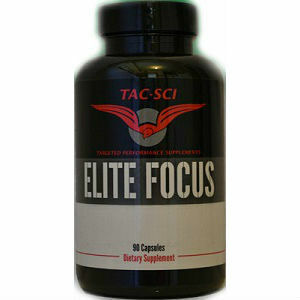 TAC-SCI Elite Focus claims to improve mental and visual clarity with its blend of ingredients. Its ingredients may be appealing to some people due to their many benefits. While there are various pluses to using this supplement, like most supplements, individual results may vary. The manufacturer’s website lacks customer reviews, which is questionable and may be a concern for those considering purchasing the product, as they do not know if there has been anyone who has had a positive experience with the supplement. For the amount of benefits this product has, the price is affordable and may be worth the money if the pills do in fact improve mental and visual clarity. The good thing is if they don’t, the 100% satisfaction guarantee allows you to return the product for a full refund. Overall, this product may or may not be for you depending on what you are looking for. Henry Costa	reviewed TAC-SCI Elite Focus	on June 14th	 and gave it a rating of 2.5.